A student attends the Kern County STEMposium held last year at Bakersfield College. 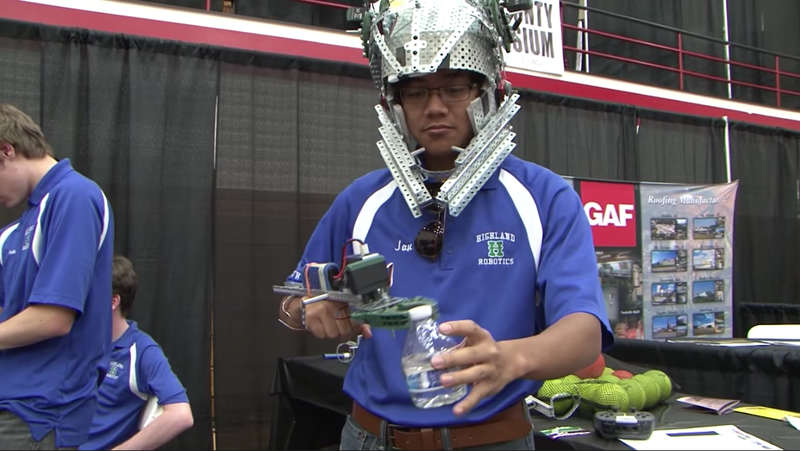 A Highland High student works with robotics during the Kern County STEMposium last year at Bakersfield College. There’s a 10-percent shortfall of highly-trained employees regionally, something that frequently keeps large businesses that require Science, Technology, Engineering and Mathematics-focused employees from setting up shop in Kern County, said KEDF Executive Director Cheryl Scott. When it comes to women, the figures are striking, Scott said. Nationwide, women make up 50 percent of the workforce, and about 26 percent of the STEM workforce. In Kern County, however, women fill just 17 percent of STEM jobs. Scott said that’s a result of a variety of challenges, including gender-based discrimination in the workplace and a waning interest in STEM as young girls progress through high school and into college. 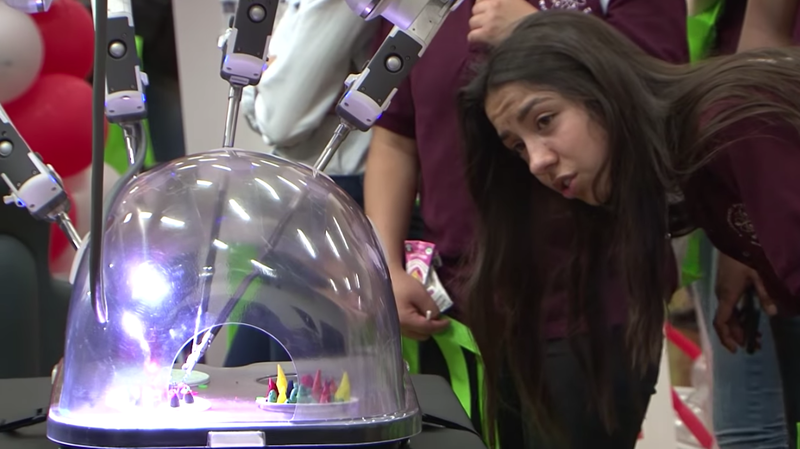 So KEDF is tackling what it can next month, launching a one-day STEMposium that will bring together businesses, teachers and students for an expo at the Kern County Fairgrounds that will feature robotics, engineering marvels and glimpses of the types of jobs kids — especially girls — can expect to snag if they stay the course with STEM education. “The goal is to light a fire in young kids to help them know this is something they can do right here in Kern County,” Scott said. It’s being billed as a ‘science fair that meets a job fair.’ High school students will present their STEM projects to younger students while businesses display equipment and demonstrate skills needed in STEM workplaces. Last year, one business brought a da Vinci Surgical System robot, which allows its user to perform an operation using what looks like a video game controller. Schools from across the county, including Ridgecrest, are planning to attend, Scott said. She’s hoping that the expo will lead to better relationships between school officials and business leaders, which could afford students job-shadowing opportunities, internships and mentoring. “There’s sometimes a chasm between those two communities, but they really need each other, and its important that they know what’s going on in the other realm,” Scott said. She’s already gotten to work putting together a program for 50 girls at Buttonwillow School District who will receive two years of mentoring from female professionals who use STEM in their jobs. The goal is to prepare girls for jobs in STEM, even in the face of adversity. A survey of local female STEM professionals shows that many felt undervalued at work compared to male colleagues in the same job, and the need to "reprove themselves over and over," Scott said. Many of those women surveyed said they wanted to reach out to girls while they were still impressionable and help them understand they can be anything they want to be. The women involved in the Buttonwill mentorship program would come from a variety of industries. One of the advantages of that, Scott said, is it would expose girls to a variety of STEM-based jobs that they might not be award of, like land surveying, a more obscure STEM job that could be at risk of falling victim to an aging workforce, Scott said. “Kids really just know what their parents do and what their teachers tell them about,” Scott said, urging the importance for teachers to build relationships with business leaders so that they know what the employment needs are communitywide. With the STEMposium, business leaders have been meeting with school officials, which could help influence curriculum toward more STEM-based learning. Many districts, including Kern High School District and Bakersfield City School District, have been investing in project-based learning. KHSD, for example, has invested millions in career technical education centers and a planned expansion in the southwest, and BCSD has plans to construct a STEM academy in southeast Bakersfield. “It’s difficult to recruit to the interior of California,” Scott said. It’s something business executives are aware of, which makes it all the more difficult when they look at the area’s workforce. The region not only lacks a surplus of highly-skilled workers, but also boasts one of the nation’s highest percentage of “disconnected youth,” or 16-24-year-olds who are not working and not in school, according to a 2015 Measure of America study. Scott pointed to that lack of preparedness as a reason why internships, mentoring and job shadowing in the STEM field are so critical locally. Its a great article and thank you so much for the share.